Every question page has a list of related questions on the left. A few months ago, a change was rolled out on all SE sites to add a score indicator to each question in the list. On some other sites, this indicator also shows whether the question has an accepted answer. The example below is from ux.SE. The first and third related questions do not have an accepted answer, but the second one does. I find the answered/unanswered indication to be more useful than the question score. When looking for answers, it gives you a hint as to which related questions are likely to have the answer you're looking for. When answering questions, it gives you a hint as to which related questions might benefit from an answer you can give, or which are useful targets for "try the answers here and come back if you're still stuck" links. Can we have this indicator too, like other SE sites? 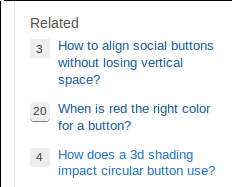 Browse other questions tagged feature-request design related-questions .